According to tradition, the tiny stone house is considered to be the home where Mary was born and raised and also the house in which the Holy Family was thought to live when Jesus was a boy. It also is held to be the place where Mary received the angel’s annunciation and conceived the Son of God through the Holy Spirit. With his visit, the Pope will encourage young people and pray that Mary “takes them by the hand and guides them with joy” to their own generous declaration of “Here I am, the servant of the Lord; may it be done to me according to your word,” Archbishop Fabio Dal Cin of Loreto told Vatican News yesterday. The Pope will sign the document in the basilica housing the shrine on Monday, the feast of the Annunciation. The Vatican announced on Wednesday that the postsynodal apostolic exhortation – titled in Spanish, Vive Cristo, esperanza nuestra, (Christ, Our Hope, Lives) – would not be made public until a later date. 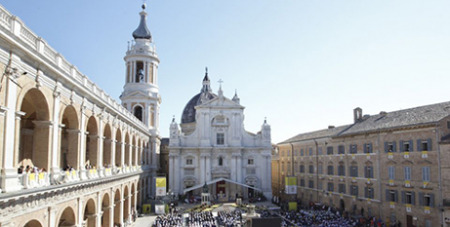 Millions of people visit Italy’s most important Marian shrine each year. It was even popular with St John Paul II, who went to this eastern seaside town five times during his pontificate.